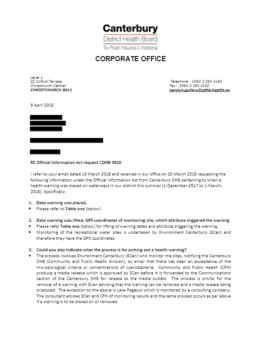 When were health warnings placed on waterways in Canterbury last summer Dec 2017 – March 2018. Date warning was lifted, GPS coordinates of monitoring site, which attribute triggered the warning. Process for putting out a Health Warning. ​Does the DHB publish the data or warning on their website? Do they put out a press release? Do they collaborate with the Regional Council before, during or after the warning? Can you describe the process.